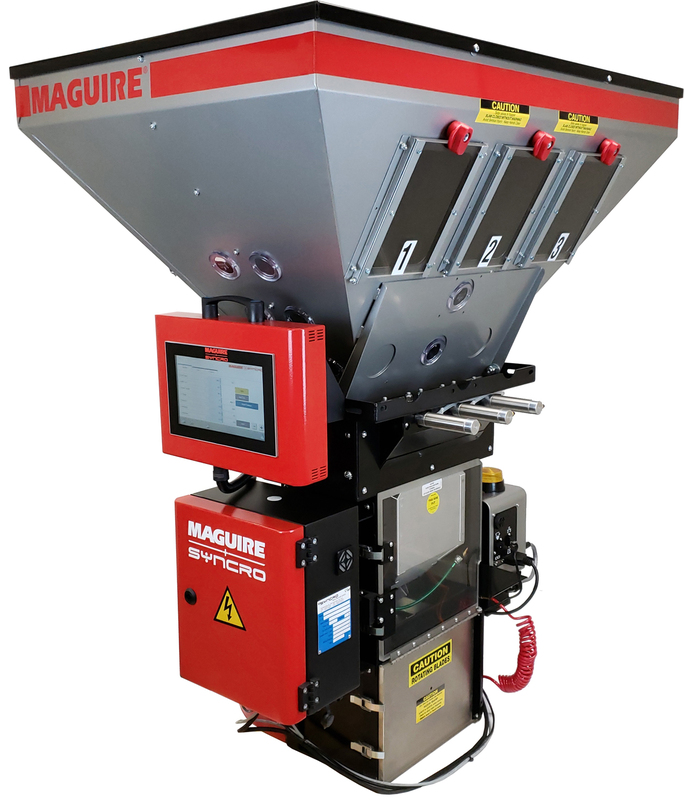 Maguire Products, Inc. has launched the WXB Weigh Extrusion Blender that provides extrusion control based on batch precision and metering accuracy. According to the manufacturer, the machine can be interfaced with a supervisory system that controls the total production line and has been proven effective in blown and cast film, sheet, pipe and profile, and wire and cable applications. The blender incorporates a gain-in-weight (GIW) weigh bin and a loss-in-weight (LIW) mix chamber in one machine with a Maguire 4088 controller. While the GIW function weighs batch ingredients as they are dosed sequentially into the weigh bin, the LIW mix chamber makes possible accurate metering of the blend into the processing machine and facilitates control of extrusion and haul-off in accordance with process variables. The tight tolerance achieved by the blender (within +/– 0.1 %) is a key to conserving raw material, said Maguire. The 4088 controller is designed for communication with other systems in an Industry 4.0 setting. It enables the WXB blender to interface with the Maguire + Syncro supervisory system, which provides control of all segments of the production line from a single touch-screen HMI control. In blown film production, e.g., the system controls extruder temperature, raw material metering and consumption data, air ring automation, gauging, internal bubble cooling, web and cage handling, haul-off, and winder. The system can be deployed for coextrusion with multiple extruders. The Maguire + Syncro control display allows users to easily visualise single-layer and coextrusion processes. Modes of extrusion control available include pounds or kilograms per hour, weight per length of extrudate, and product thickness in µm. Initially the WXB blender is available in three models: WXB 100 for throughputs of 100 – 220 lb/h (50 – 100 kg/h), WXB 200 for 220 – 440 lb/h (100 – 200 kg/h), and WXB 400 for 440 – 880 lb/h (200 – 400 kg/h). The blenders can be configured for up to twelve ingredients, each with a separate dispenser. The WXB blender is compact and includes guards for safe operation. The mix chamber is easily removed for quick cleanout. All loading system options available from Maguire are integrated into the controller.